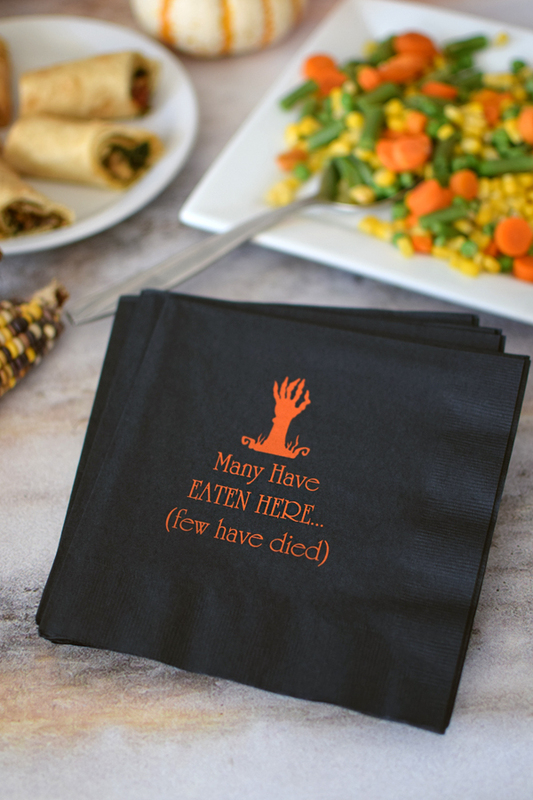 A great size for serving appetizers, finger foods, and other spooky desserts, personalized Halloween party luncheon napkins measure 6 1/2 inches square and are custom printed with an festive Halloween design and your own custom message. Luncheon napkins are a great alternative when larger dinner napkins are not desired. These versatile napkins can be used for appetizers, dessert, and dinner. Personalized your napkins with your choice of design, lettering style, and colors to match your party theme. Luncheon napkins are made from disposable, 3-ply paper and measure 6 1/2 inches square. Made in the USA.